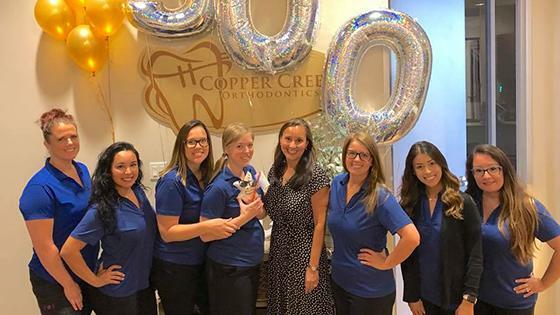 Cypress Orthodontist - Copper Creek Orthodontics is dedicated to helping orthodontic patients of all ages achieve the beautiful, healthy straight smile they derserve! 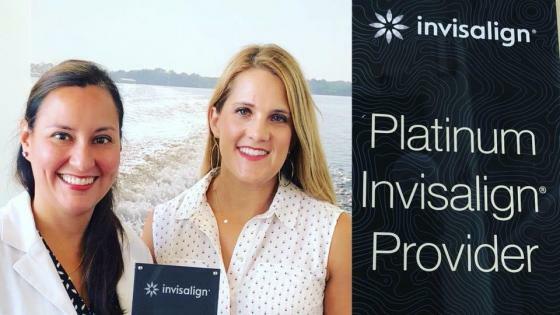 We know that our office is only as effective and as welcoming as the people who work in it, which is why we take pride in our friendly and well-trained team members! Everyone is so friendly and the office is beautiful. I really look forward to my visits. A mis 2 hijas las an atendido asu hora. Cita de revisar sus progresos. As usual a wonderful experience!!! 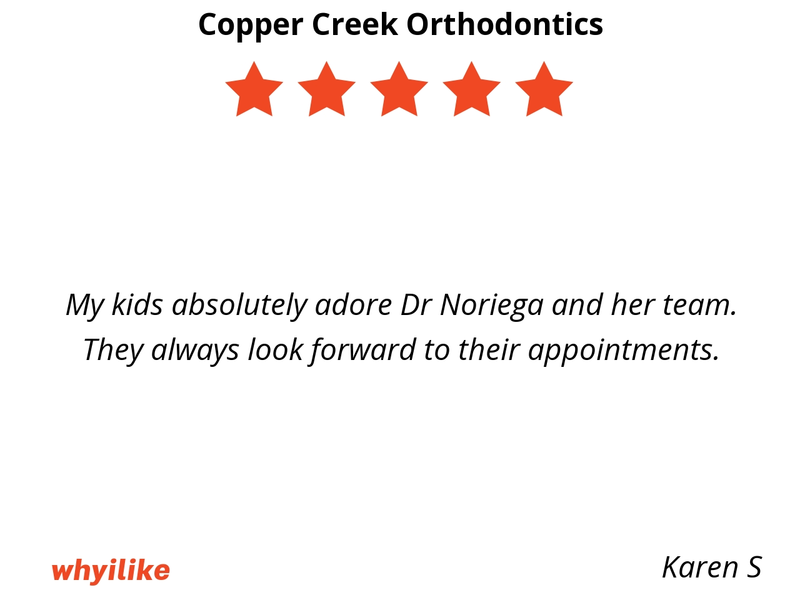 My kids absolutely adore Dr Noriega and her team. They always look forward to their appointments. 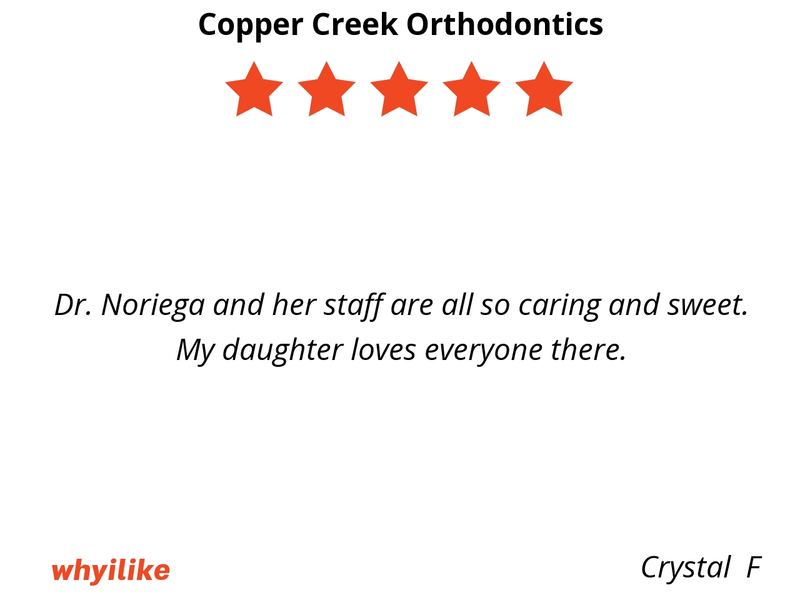 Dr. Noriega and her staff are all so caring and sweet. My daughter loves everyone there. Always a bright, and lovely place. The staff is welcoming and personable. 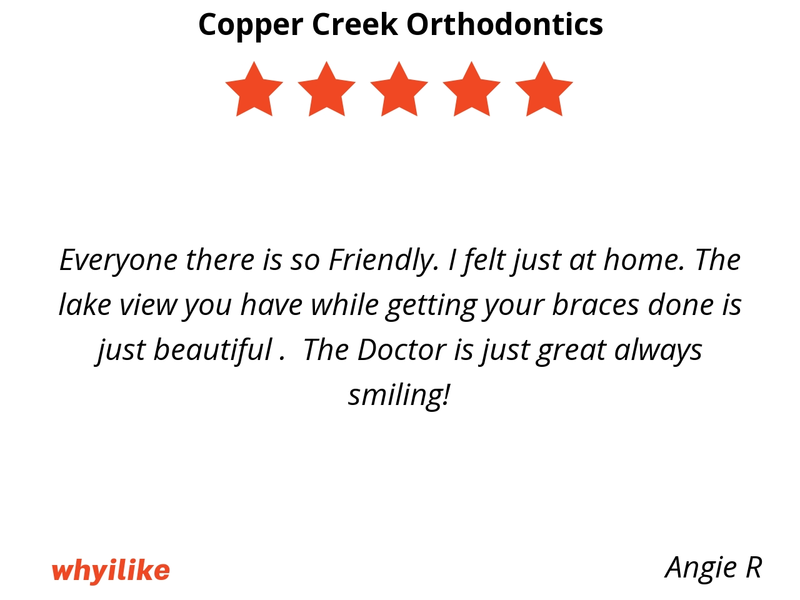 We always feel very comfortable and well taken care of! They are very professional and caring about the patient.. The office is so helpful and friendly . 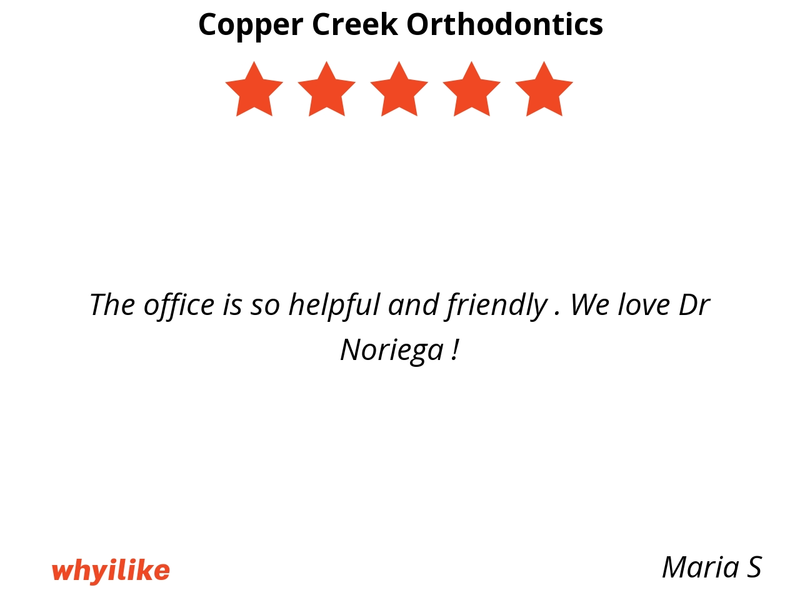 We love Dr Noriega ! 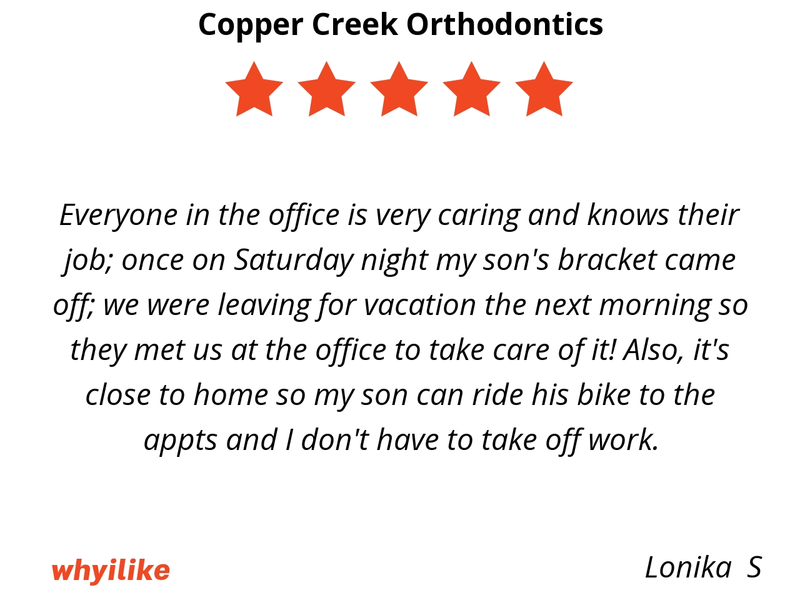 Everyone in the office is very caring and knows their job; once on Saturday night my son's bracket came off; we were leaving for vacation the next morning so they met us at the office to take care of it! Also, it's close to home so my son can ride his bike to the appts and I don't have to take off work. Staff is nice, professional, comforting, and the environment is clean. 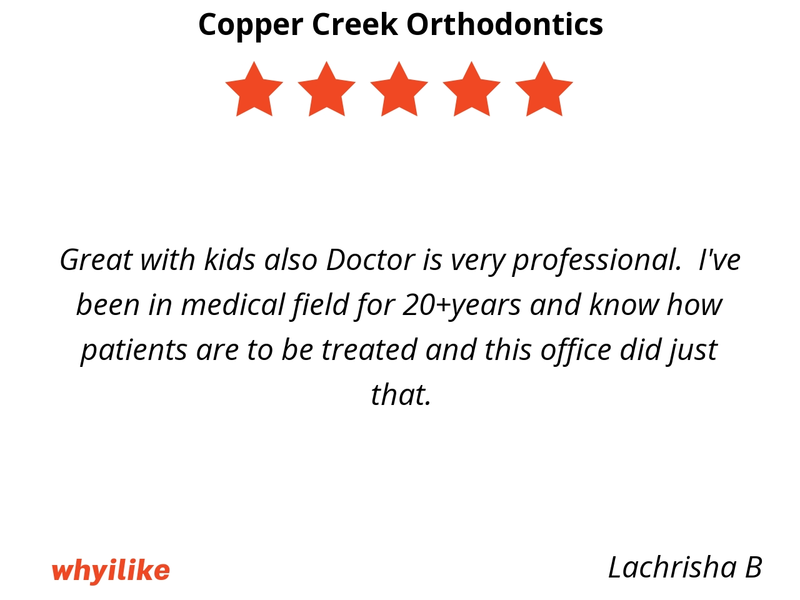 Amazing staff very friendly and fun environment, my kids love their orthodontist appointments, very quick and easy. Highly recommended. 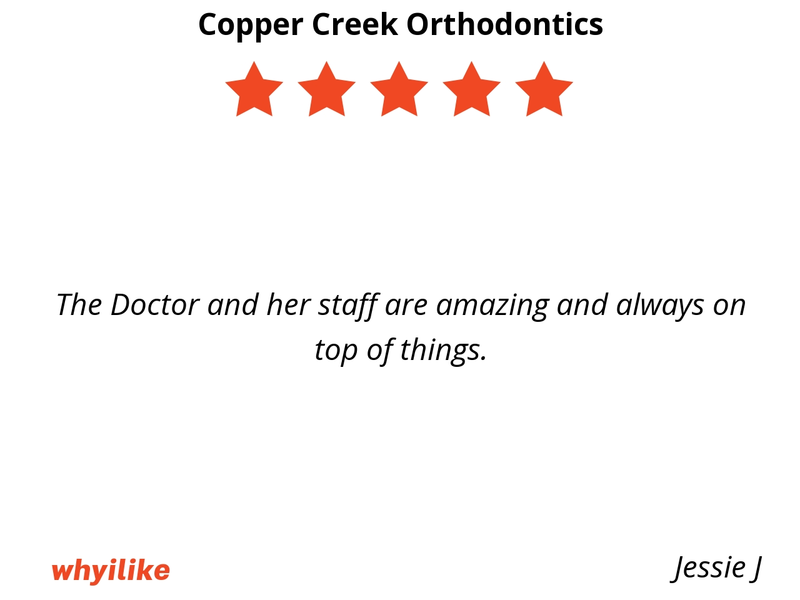 The Doctor and her staff are amazing and always on top of things. Everyone there is so Friendly. I felt just at home. 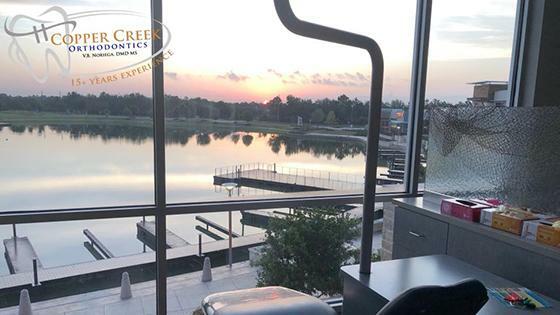 The lake view you have while getting your braces done is just beautiful . The Doctor is just great always smiling! Comfortable. Not a long wait. In and out very quick, and very understandable. Also it is nice and easy to reschedule. Great with kids also Doctor is very professional. I've been in medical field for 20+years and know how patients are to be treated and this office did just that. 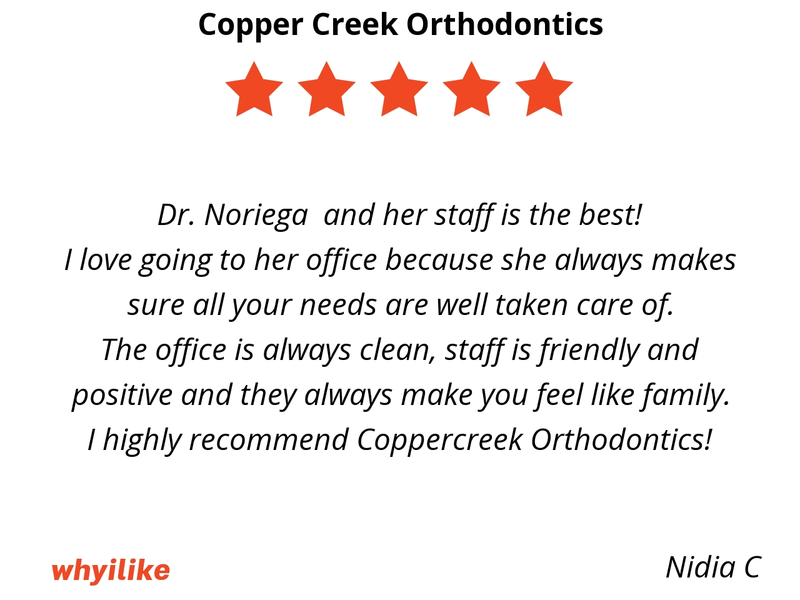 Dr. Noriega and her staff is the best! I love going to her office because she always makes sure all your needs are well taken care of. 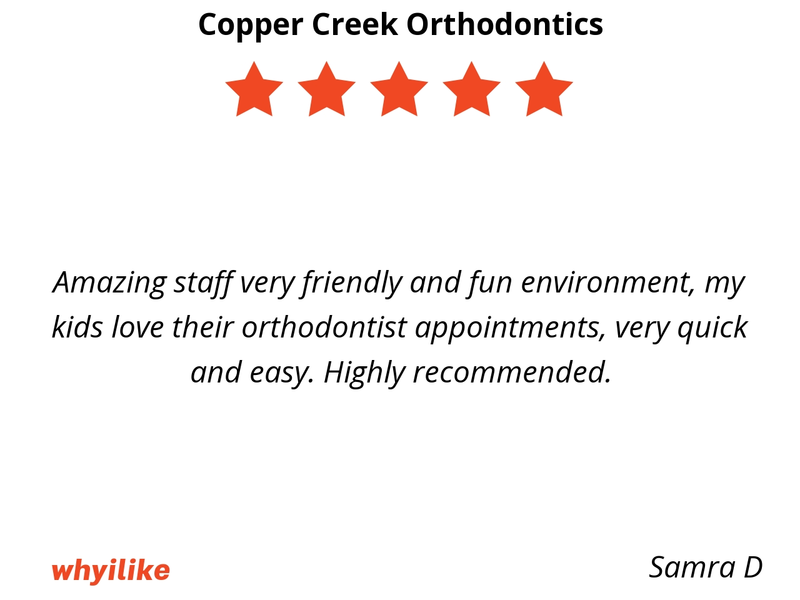 The office is always clean, staff is friendly and positive and they always make you feel like family. 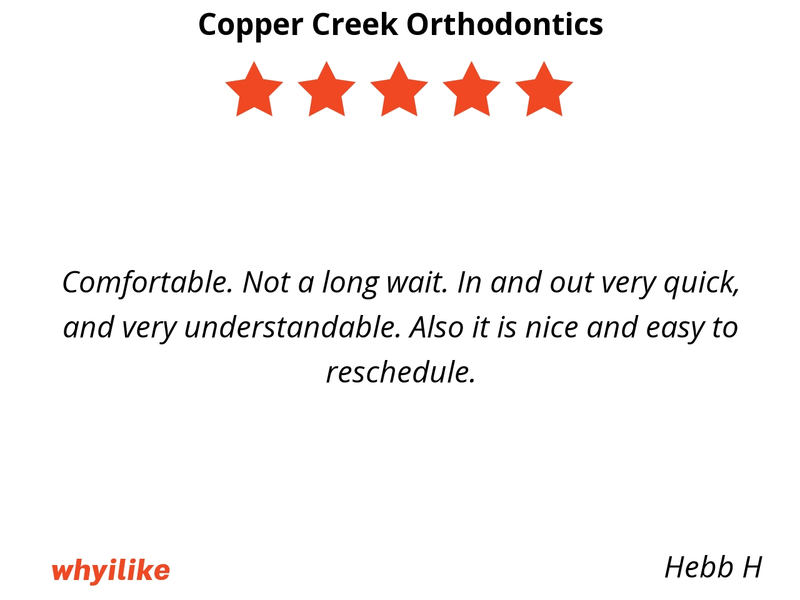 I highly recommend Coppercreek Orthodontics! 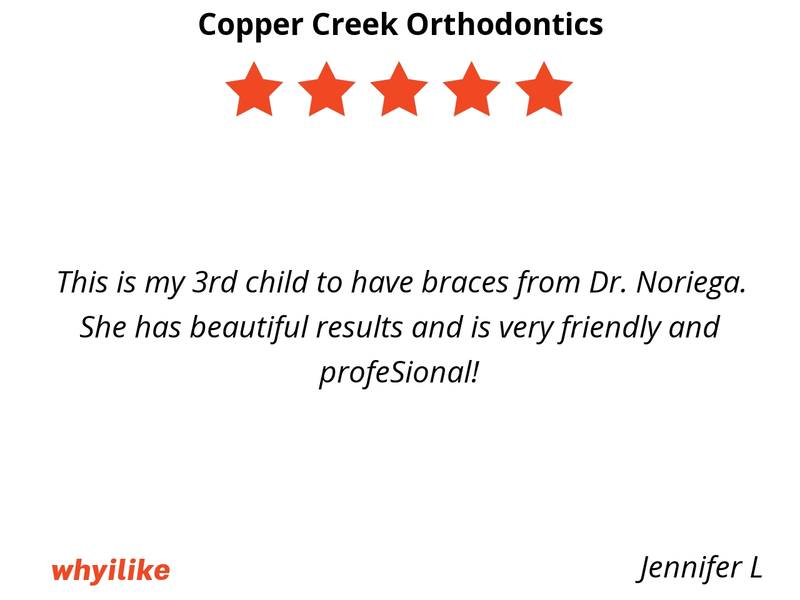 Staff is always friendly and helpful and accommodating!!! Ready to answer any questions and keep appointments on schedule!! 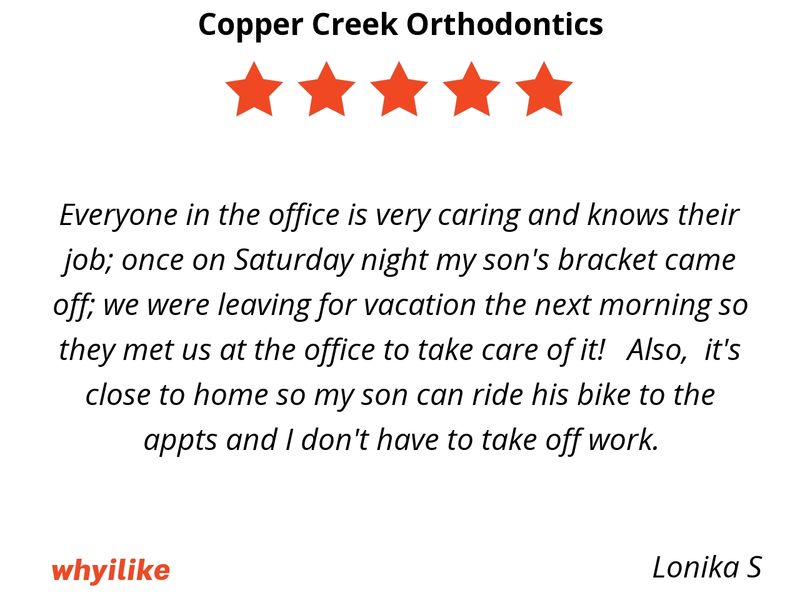 Copper Creek Orthodontics was the best choice for my children ! There is always positive energy and the staff is very kind . 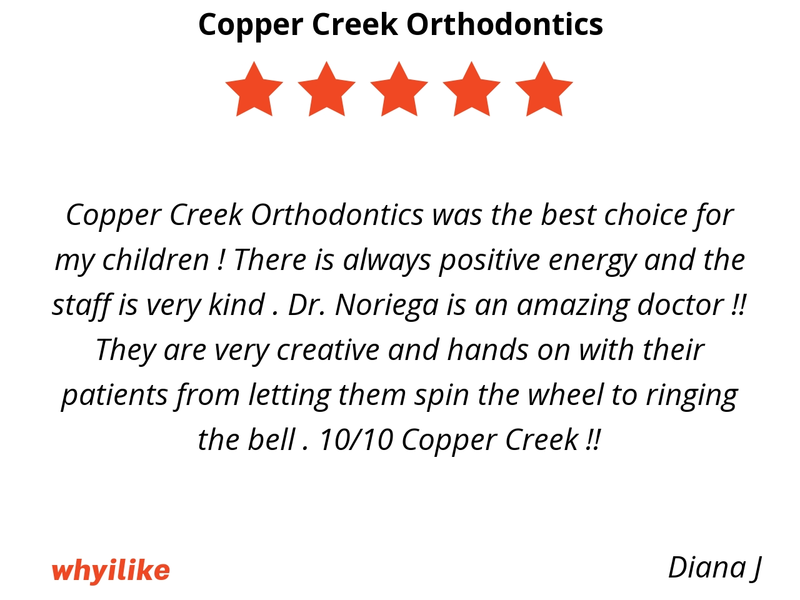 Dr. Noriega is an amazing doctor !! They are very creative and hands on with their patients from letting them spin the wheel to ringing the bell . 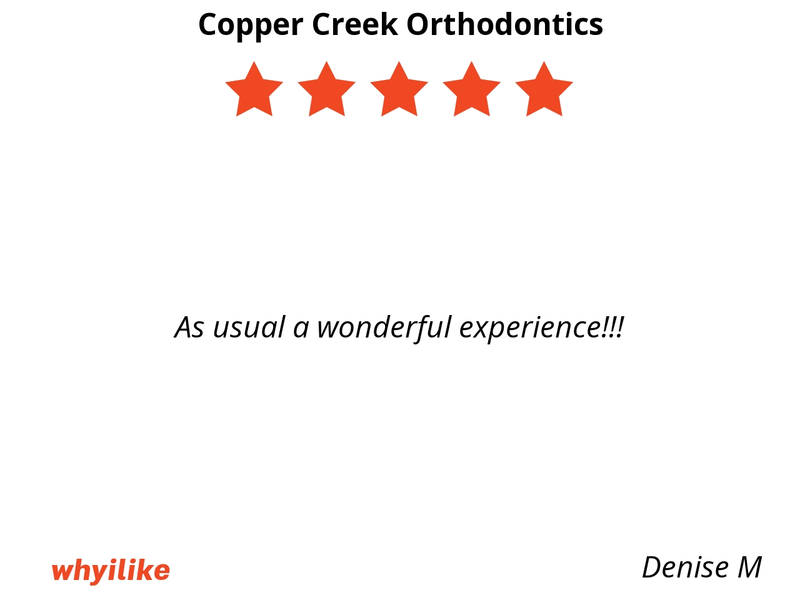 10/10 Copper Creek !! 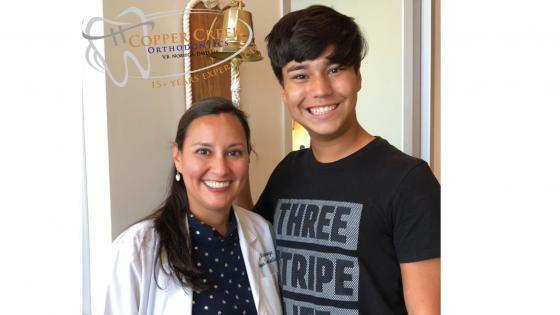 This is my 3rd child to have braces from Dr. Noriega. 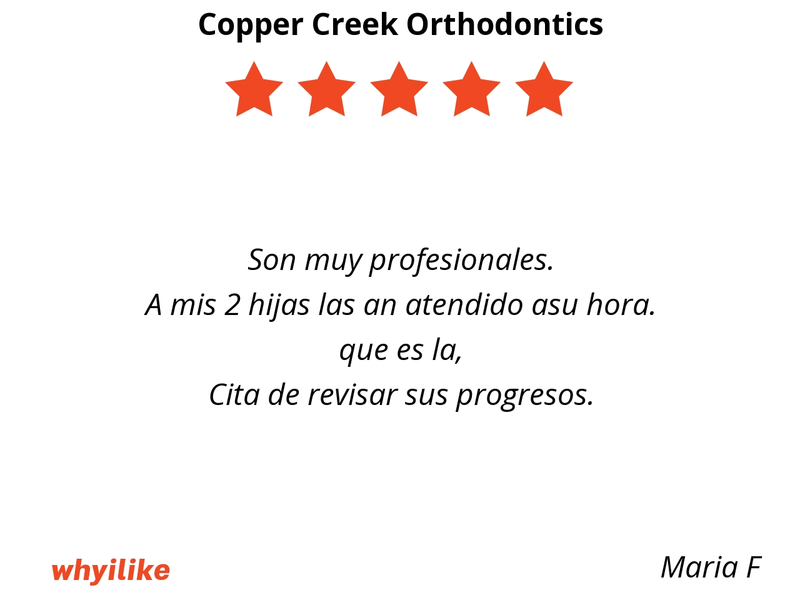 She has beautiful results and is very friendly and profeSional!